Athletes from over 90 countries will gather to compete in the Games of the XXIII Olympiad in Pyeongchang, South Korea from February 9 through February 25 (some events begin on February 8). The event, commonly referred to as the 2018 Summer Olympics, will kick off its Opening Ceremonies on February 9 at Pyeongchang Olympic Stadium. The Closing Ceremonies will be held on February 25 at the same venue. Fifteen sports will be featured, including traditional fan favorites such as figure skating, ice hockey, speed skating, alpine skiing and cross country skiing. Pyeongchang was awarded the games on July 11, 2011 by the International Olympic Committee on its first round of voting. The city received more votes than Munich, Germany and Annecy France, combined. Pyeongchang is the second South Korean City to host an Olympics; Seoul hosted the 1988 Sumer Olympics. Tokyo, Japan is slated to host the 2020 Summer Olympics.Beijing, China will host the Games in 2022. In the United States, events will be televised on the NBC family of networks. They Include NBC, NBC Sports Network, USA, MSNBC, CNBC, Bravo, Golf Channel, Telemundo (in Spanish) and NBC Universo (in Spanish). Events also may be streamed via the NBC mobile app. In Australia, events will be televised on the Seven Network, which includes Channel 7 (main channel), 7TWO and 7Mate. The motto of the games is "Passion: Connected." An event is described as a category of the sport in which a gold, a silver and a bronze medal is awarded. The number of asterisks next to an event denotes the number of events with medals being awarded on that particular day. Afghanistan, Andorra, Argentine, Armenia, Australia, Austria, Azerbaijan, Belarus, Belgium, Bermuda, Bolivia, Bosnia and Herzegovina, Brazil, , Bulgaria, Canada, Chile, China, Colombia, Croatia, Cyprus, Czech Republic, Denmark, Dominica, Ecuador, Eritrea, Finland, France, Georgia, Germany, Great Britain, Greece, Hong Kong, Hungary, Iceland, India, Iran, Ireland, Israel, Italy, Japan, Kazakhstan, Kenya, Kosovo, Kyrgyzstan, Latvia, Lebanon, Liechtenstein, Lithuania, Luxembourg, Macedonia, Madagascar, Malaysia, Malta, Mexico, Moldova, Monaco, Mongolia, Montenegro, Morocco, Netherlands, New Zealand, North Korea, Norway, Olympic Athletes from Russia, Pakistan, Peru, Philippines, Poland, Portugal, Puerto Rico, Romania, San Marino, Serbia, Singapore, Slovakia, Slovenia, South Africa, South Korea, Spain, Sweden, Switzerland, Chinese Taipei, Thailand, Timor-Leste, Togo, Turkey, Ukraine, United States, Uzbekistan. The Alpensia Resort in Daegwallyeong-myeon is the focus of the 2018 Pyeongchang Winter Olympics. 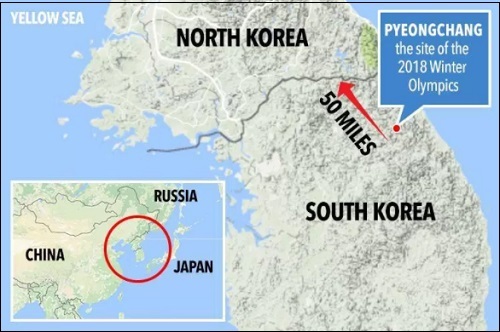 Pyeongchang is located approximately 110 miles east of the South Korean capital of Seoul. It is actually a county in the Gangwon Province of the country, located in the Taeback Mountains region of South Korea. The elevation ranges from 2,300 to 2,600 feet above sea level. Some areas of the province lie 3,300 feet above sea level. The average temperature during the month of February is minus-5.5 degrees (fahrenheit). There is a relatively significant tourism draw in Pyeongchang, including hiking and skiing. Since being awarded the Games of the XXIII Olympiad in 2011, the area has been getting ready for these Games. 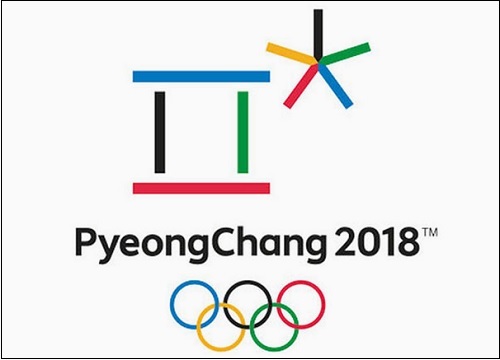 In late November, NBC analyst Mike Tirico reported on The Dan Patrick Show that Pyeongchang had completed construction of its major event facilities. Tirico added that, at the time, ticket sales for the events had been sluggish. Pyeongchang has a population of 43,666. There are seven townships within the county. Pyeongchang petiitoned for the Olympic Games in 2010 and 2014, but lost out to Vancouver, British Columbia, Canada and Sochi, Russia, The city is being promoted as "PyeongChang" (capital "C") to avoid confusion with Pyongyang, the capital of North Korea, located appropriately, to the north of South Korea. Pyeongchang hosted the 2013 Special Olympics World Winter Games, and the 2009 Biathlon World Champions were held there as well. South Korea is bordered on the west by the Yellow Sea, on the south by the South China Sea, on the east by the Sea of Japan, and on the north by North Korea. Today it starts with Curling and some Ski Jumping. In many ways, I prefer the winter games to the summer games. There's just something about the skiing and other events which is fun to watch. Curling is always interesting. I find it so fascinating! We were just watching some women's moguls. That's my favorite. Sad about the girl from Canada at the end. Four years of training, then she faltered at the beginning and never recovered. It all lasted seven seconds. The Olympics have actually been quite entertaining thus far. Go Team USA! I love the snowboarding. The U.S. has swept gold in the slopestyle and halfpipe!